Raising the specter of drugs, human smuggling and crime, President Trump told Americans Tuesday the partial government shutdown would continue until Democrats fund his border wall. 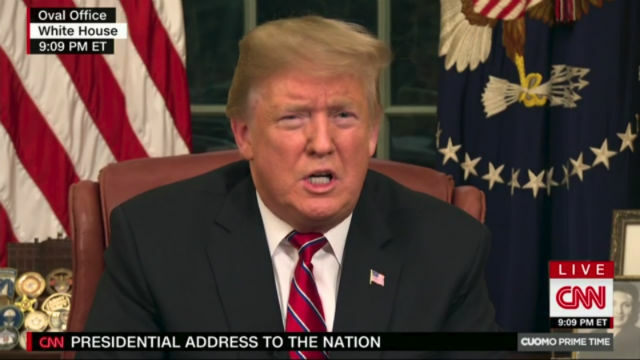 “The federal government remains shut down for one reason and one reason only — because Democrats will not fund border security,” Trump said in his first-ever address to the nation from the Oval Office. He said a barrier along the border with Mexico is “is absolutely critical” and pointed out that he had compromised by agreeing to a see-through steel fence instead of a concrete wall. He cited drug smuggling, human trafficking and crimes committed by immigrants as the reason a wall is necessary. However, Trump did not declare a national emergency, under which he could potentially divert funds from the military to build a wall. Many political observers said such a move would face extensive court challenges. The shutdown is now in its 18th day with 800,000 employees furloughed or working without pay. Many federal contractors are also affected. Trump has refused to sign legislation funding the government unless it includes $5.7 billion for a border barrier. Democrats controlling the House have agreed to fund only $1.3 billion for border security. “The fact is, the women and children at the border are not a security threat, they are a humanitarian challenge,” the San Francisco Democrat said.